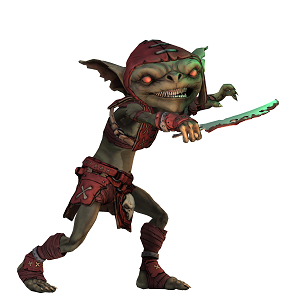 One day, Narc became fed up with life as typical goblin ambusher. It wasn’t fullfiling enough for him, so he decided to leave his tribe. He made his way to Mulmaster, where he quickly learned to survive in the many shadowed recesses of the city’s narrow streets. One day, a dwarf named Saul—a footman in the house hold of Astrid Saj—discovered him. Along with a Goliath bodyguard, Saul saved Narc from being killed by a group of thugs in an alley. Saul took Narc back to work for Astrid Saj, where he serves as her spy in Mulmaster. NOTE: Narc was killed in an encounter against the Kron brothers. Read how it happened in Hatred like Clawed Wind.